We wanted a name for our project which was open, flexible and which didn’t carry too many qualitative suggestions as to what the work might be or look like. ‘Nora’ is very simply a combination of our names ‘Eleanor’ and ‘Flora’. It’s an impressive line up of choreographers you are working with. Is there anything they have in common that appeals to you? The choreographers each make very distinctive work – they all have had many influences throughout their lives but have landed upon a creative practice which is meaningful to them and which they have delved into deeply. They all work very differently to each other but they share a certain determination and belief in what they do. Because of this clarity we have been able to thoroughly immerse ourselves in each of their worlds. What has the working process with Liz Aggiss been? Liz Aggiss conceived BLOODY NORA! before we met her in the studio. She first wrote the structure of the piece, the choreography and script and then taught us how to deliver and embody it. The piece is an extension of her own performative practice but is shaped by the specifics of who we are – we are two people, we are young, we are friends – all of these things inform her choreography and make it completely different to anything she would be able to perform herself. The process has been about us adopting her performative approach and enjoying entering the roles she has made for us and filling them with our own bodies, lives and experiences. Are you the first artists to be allowed to dance one of Jonathan Burrows and Matteo Fargion’s famous duets? When we invited them to make a piece Jonathan and Matteo immediately thought about the questions: ‘Could our work be performed by other people? And by women?’ They have often been asked these questions but have never had a chance to try them out until now. So, they gave us the musical score that they used to make their very first duet together, Both Sitting Duet, gave us some thoughts on working born from their many years of working and performing together and invited us to choreograph freely a new piece. Eleanor And Flora Music is this new work. What is emerging as two young women re-imagine the work made for and by two middle aged men? The process of re-translating this work has been surprising and exciting for both parties. Gender and age have emerged as visible subjects, as have other things such as the echoes of history, reverence, the return of abstract dance, and the question ‘what is radical?’. We have dwelled upon some topics and others have been more fleeting. Essentially, the idea of re-imagining Jonathan and Matteo’s work is a very simple one, but it has thrown up many complex questions and topics which have taken us round and round in interesting circles. Eleanor And Flora Music is a unique creation which is entirely independent of the original Both Sitting Duet, but which also relies on its existence. Ultimately we have realised that at the centre of the whole process is the musical score, For John Cage by Morton Feldman, and if we stay true to this then everything else can exist around it – bouncing off it and coming in and out of focus. We first saw Simon Tanguy performing at The Place in London and were very compelled by the combination of discipline and improvisation in his work. Flora had a question, which was much like the question that Jonathan and Matteo’s had in relation to their work: ‘Could anyone else perform it? Could it be created on women?’. We wondered if a female version could exist in a world where women are considered to be less funny, less spontaneous, less strong than men? We wanted to give ourselves the challenge and be pushed towards jumping into these roles. Simon’s work brings up many subjects – humour, intellect, character, embodiment, our experience as women – all of these combining to create a portrait of us, two 27 year old women in 2015. It is very varied, exposing the three very different worlds of the choreographers. All pieces require us to be physically committed and somehow ruthless as performers – constantly abandoning the old for the new – be it through the formality of Jonathan and Matteo’s piece, the changing postures of Simon’s work or the historical slapstick of Liz’s BLOODY NORA! Tanguy’s process has been the one which has changed shape the most through its evolution – starting with improvisation and moving towards a set choreography and a scripted text. We are learning how to move between the worlds of all the three pieces and how we can find their connections and differences in order to move through them as free agents. 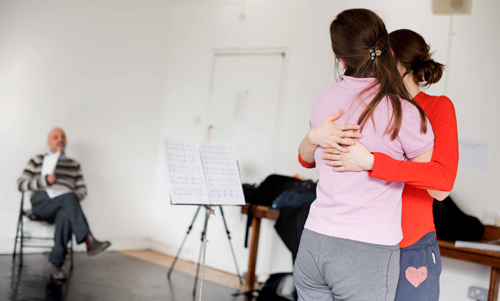 Photos: Flora and Eleanor working on Jonathan Burrows and Matteo Fargion’s piece, by Camilla Greenwell. Nora Invites… has been funded in part by The Monument Trust which supports co-productions and new commission at Sadler’s Wells.